Wading in the Intracoastal Waterway just behind Gumbo Limbo, we catch (and release) fish, shrimp, crabs, and more! 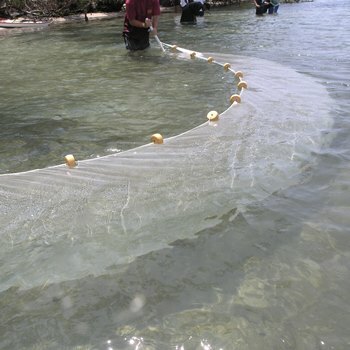 With hand-held dip nets and large seine nets, get up close and personal with our local marine life. Closed toed shoes required (old sneakers or water shoes; no sandals). Bring a change of clothes and towel. Ages 10-adult; children under 18 must sign-up and participate with an adult. Cost per person: Member $7, Non-member $10. Online registration will close 48 hours before the start of this program. Walk-ins welcome based on availability. Program may be cancelled due to poor weather conditions or registration below-minimum required number.